Get ready for summer without all the prep work with this FREE June Summer Activities Guide perfect for kids of all ages this summer. If you are looking for some help planning lots of fun summer activities for kids, I’ve got you covered. I have a Summer Bucket List in the form of monthly Activity Guides this year. First up, here are great summer activities for families in June. Last year I shared a massive 107+ Must Do Summer Activities and the year before I shared a blank printable summer bucket list. They are both great resources, but I found that many of my readers were struggling to actually do any of the activities because, well they still had to do the planning. 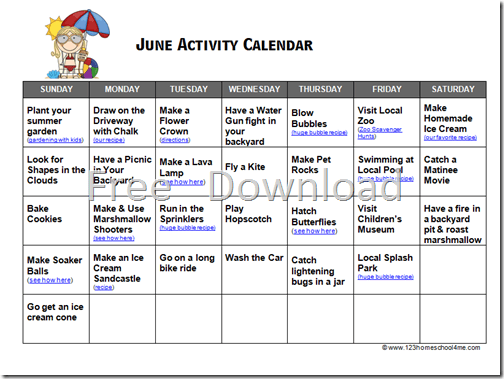 To help all you busy families out I have made 3 Summer Activity Guides to cover June, July and August. Each day of the month has a unique, fun, and memorable family activity listed. By all means, skip or jump around if you like, but this way you have a basic plan to get you started. What Activities is Your Family Looking Forward to This Summer?